overreach. Their dejection permeates everything, and nothing seems right--even the things that did a few months ago. In the social media debris following Italy's disintegration yesterday, people are desperate to find their footing (including yours, faithfully), some clinching reason or evidence that explains everything. You can't blame them exactly. Italy's failure to qualify for the World Cup for the first time since 1958 is a catastrophe. And that catastrophe, especially for the fans, leaves a void that everyone rushes to fill with theories. In a perverted way, it is comforting to think, for example, that the Italian national team's failure mirrors the broader shortcomings of the nation, that somehow Italy's high median age has an impact on the FIGC's personnel and outlook, that the federation's administrators are a symptom of the nation's political culture of backroom deals and raccomandazione (influence and backing to secure and stay in key positions). These ideas are seductive because they allow us to imagine solutions at a more manageable level: a purge of easily identifiable culprits in football rather than of the whole infected political class of the country. Predictably, yesterday, there were calls to rid the Italian federation of its "dinosaurs," the 74-year-old president Carlo Tavecchio, and his choice for coach, Gian Piero Ventura. They should both go, undoubtedly. The reprehensible Tavecchio should have been gone soon after his racist outburst in 2014. But they shouldn't be fired because they are septuagenarians (or in the case of the 69-year-old Ventura, an almost-septuagenerian). They should be fired because they were not the right men for the job. Marcello Lippi was almost 60 when Italy won the World Cup in 2006 (incidentally, Franco Carraro, the former president of the FIGC who resigned following revelations of his involvement in Calciopoli, was 67). It is not as if at 69, a coach automatically becomes incapable of training a group of players to make it past an average Sweden side. The silver-haired paternal mister is as much part of Italian football's iconography as the fresh-faced Coverciano graduate. But putting a number on the failure gives contours to it, something to cling to, an outline in a time of darkness. 4-2-4 was another shape in the dark. Ventura's preferred formation throughout the qualification campaign was a concave, suffocating jar that didn't allow players to express themselves. Players like Lorenzo Insigne, who most of Italy (including Daniele De Rossi) has glorified as the saviour who couldn't save the nation yesterday because Ventura didn't play him. Insigne has played for Italy 21 times since 2012. And he has scored a grand total of 3 goals. Antonio Conte didn't rely on him either. For Italy, he provides the illusion of movement, the illusion that there is something happening when he has the ball at his feet. But seldom anything does. He has shot or crossed as much into the stands as he has on target. As much as Candreva. As much as Darmian. Italy's fate didn't go through the feet of a tiny Neapolitan. It didn't hinge on a moment, on just a formation. It was a steady accretion of Venturian incompetence. A player like Insigne should be an important part of a team that functions; he shouldn't come on as a player to compensate for a lack of functionality. He's good, but not that good. In my last post, I wrote of how difficult it is to understand what this Italy side is trying to achieve under Ventura. After yesterday's debacle, it is even more difficult to understand. Ventura is spectacularly incompetent, but he has been throughout qualification, not just yesterday, or on Friday. The only thing he has done methodically in a year and a half is undo Antonio Conte's work. And he must have undone that work every time the national team met, with every drill that he oversaw, with every formation that he devised in training and the matches. It feels as if it was more difficult to get this Italian team to unlearn what Conte had managed to instill in the players than it was to get them to continue on the same path, or make slight adjustments for their new coach. But Ventura has managed that seemingly extraordinary feat with distinction. 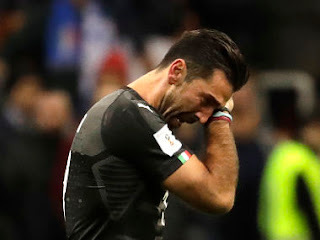 The situation is so patently absurd that we are nostalgic for the summer of 2016, when Italy were inches away from ousting Germany in the Euro2016 quarter-final, when Italy were busy swatting away Spain, when Eder curled a winner past Swedish goalkeeper Andreas Isaksson. Even allowing for clichés, 18 months is not a lifetime in football. It is just 18 months sometimes. Ventura has taken virtually the same raw material that Conte had and fashioned something hideous. A generation hadn't passed between Euro 2016 and yesterday. But now it has. Ventura's signal crime is not allowing Gianluigi Buffon, Daniele De Rossi, Andrea Barzagli, and Giorgio Chiellini the send-off they deserved. It was too much for poor old Gigi, who has shed as many tears as his fans have collectively. He was a teary mess leaving the field and during the post-match interview. In recent times we have seen him cry in finals, quarter-finals; Ventura managed to make him cry at the qualification stage. Despite all that has happened, Italian football is not in crisis as a whole. The national team is an expression of a country's football, not the expression. The clubs are doing well in Europe; Juventus have played two Champions League Finals in three years; the league looks to be the most competitive it has been for many years. This failure is not due to something rotting at Italian football's core. This failure is not due to a larger number of foreigners in the league either, despite the xenophobes tripping over themselves to say so. Italy were good enough to beat Sweden. Ventura was not. Tavecchio picked the wrong man. Tavecchio is the wrong man. There needs to be a slight adjustment; not root and branch changes. A little more than fifteen years ago, Italy were similarly brooding over a football crisis. South Korea had eliminated a team of players like Gianluigi Buffon, Francesco Totti, Paolo Maldini, Alessandro Del Piero, and Christian Vieri at the 2002 World Cup. The criticism then, too, spread across the spectrum: some raged at the referee Byron Moreno, some at Giovanni Trapattoni, the coach they denigrated as a relic, some at foreigners in the league, and some at the players who, despite several obstacles, should have taken care of an enterprising but ultimately modest South Korean team. It seemed that Italian football was headed into a period of obscurity. But in the four years that followed, Milan won the Champions League (after an all-Italian Final against Juventus) and Italy the World Cup. The latter triumph came after the Calciopoli scandal had ripped apart the domestic game. Nothing needs to be ripped apart now except Ventura's contract. A coach, a young one or one with a grizzled head like Carlo Ancelotti, just needs to revive the confidence of these young players and figure out a system that allows them to play coherently. It is not a radical approach, but it was one that eluded the hapless Ventura for many months.